Well, the brick made it all the way up the front stairs to the entry I'm happy to say! Each landing is herringbone which will be carried into the house only in hardwood. I guess it's a theme? The hardwood arrived and is acclimating in the living room. Installation date is set for Monday, August 25th. The entry, living room and dining room will be herringbone. 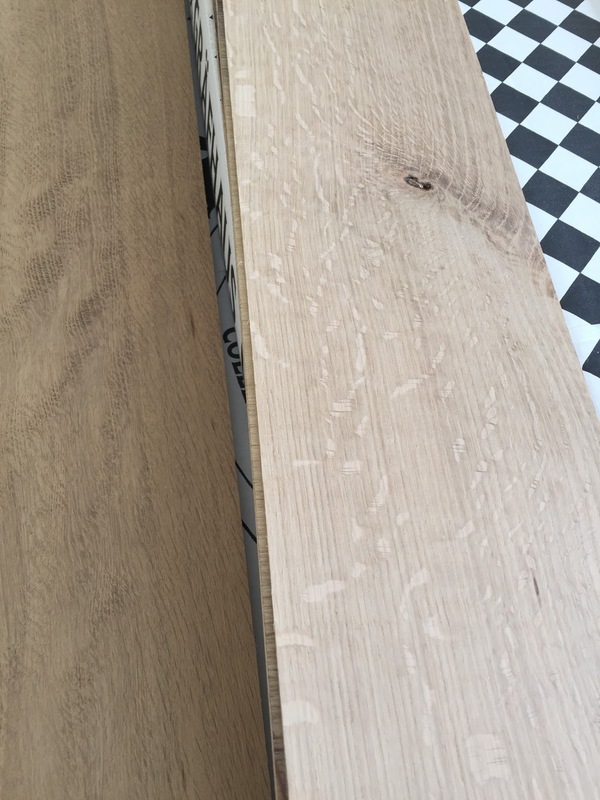 I chose a rustic quartersawn oak in six inch width, but the herringbone pattern will be narrower and the stain will be dark. The bathroom floors are now tiled! 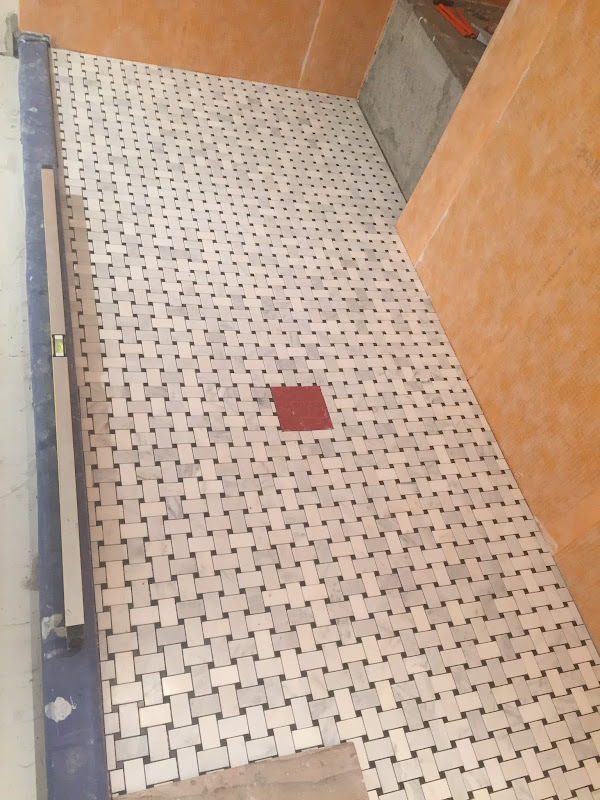 This is the master bath shower with its marble basketweave floor. 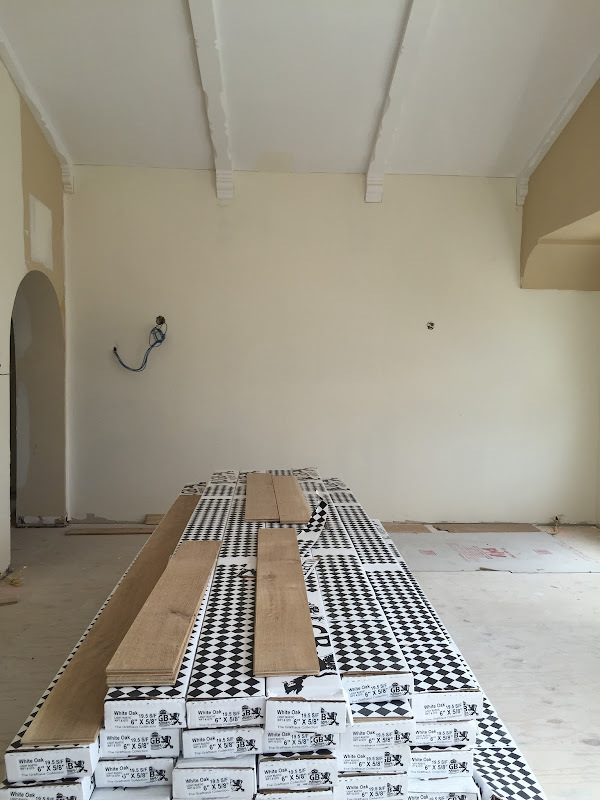 The tile will continue on the floor with a white marble threshold separating the two. ...while the dots are gray in the downstairs ensuite bathrooms. Last week, the house was crowned. Here's Michael and Febreze, the master finish carpenters at work. 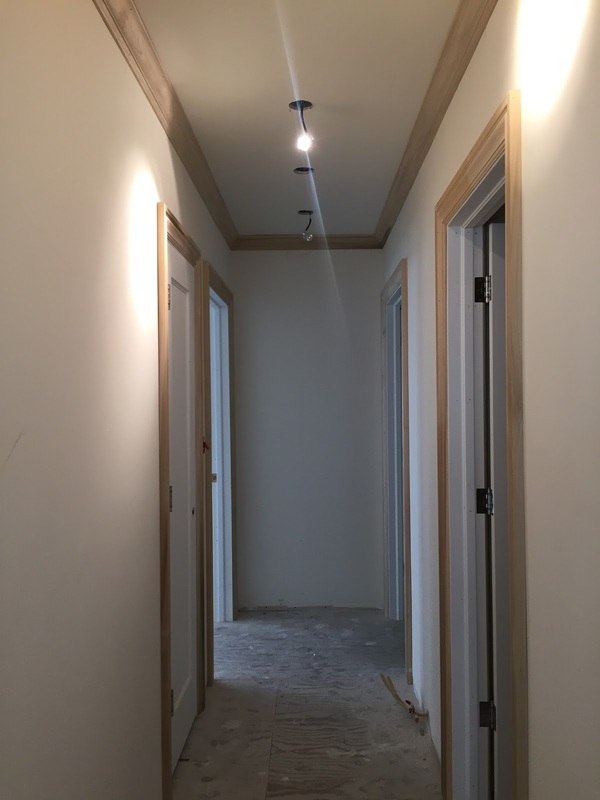 They also installed the doors and moulding. They are really into crown moulding! Michael framed out the opening to the family room and then decided the crown was too wimpy, so he mocked up a beefier crown above. It's actually three pieces. Much more substantial. It's beginning to feel like a house, don't you think? Every single element you have chosen is classic, and timeless. love it all so much!!! So exciting and I am so happy for you!! I love everything you have chosen! It is all starting to come together beautifully! So exciting! I am obsessed with that basketweave tile! I want to put that in our master if we ever re-do it. I am also loving the herringbone. Our kitchen backsplash will be installed this week and I am doing a white subway. Over the stove area will be the same subway tile but with a herringbone pattern. I can't wait to see more of your lovely home! Thanks so much for the progress update. So exciting to see the elements coming along. Can't wait to see what you choose for wall colors. It's looking so good Delores!! Oh wow, it is really coming along and looking fabulous. Hi Delores! I'm so excited for you and everything is going to be gorgeous! Delores, it looks like it is all coming together. I know it will be stunning. Can't wait to see the finished rooms. Congratulations on the progress. Everything you have selected looks fabulous. My dad was a bricklayer so I have a real soft spot for herringbone brick, so glad you used it! I love it all, especially the beefier crown. I remember this process not too long ago. It is an incredible feeling to walk in and get excited over millwork or tile. Hard to explain to someone who hasn't done it. It's shaping up very nicely. It's so true what they say that if you invest in the "bones" of a house, decorating it later is so much easier! You have chosen such beautiful, timeless elements! 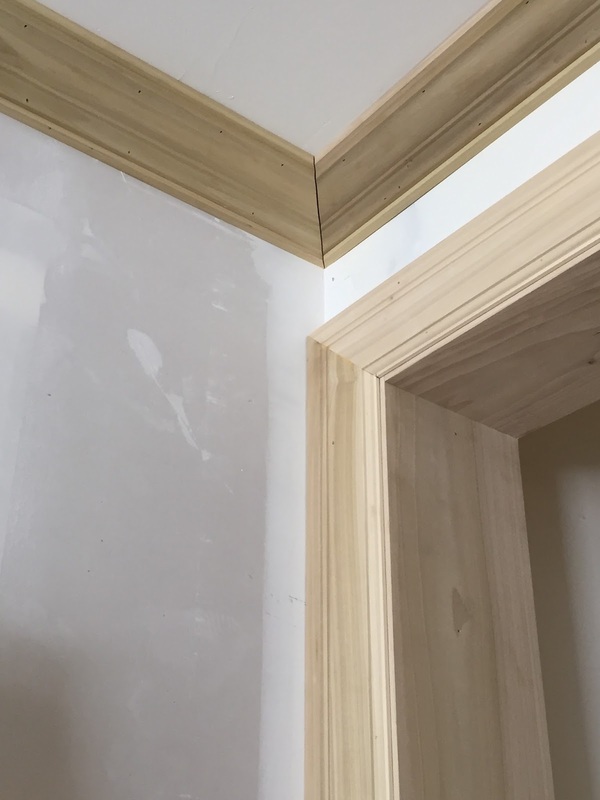 I love the beefier crown molding. That's going to make the house look substantive and grand. Oh, my gosh, I can't wait to see more! The more you show us, the more I want! I can only imagine how anxious you must be!